P Chidambaram tweeted: "I have been told that the IT department has plans to raid my residence in Sivaganga constituency and in Chennai." 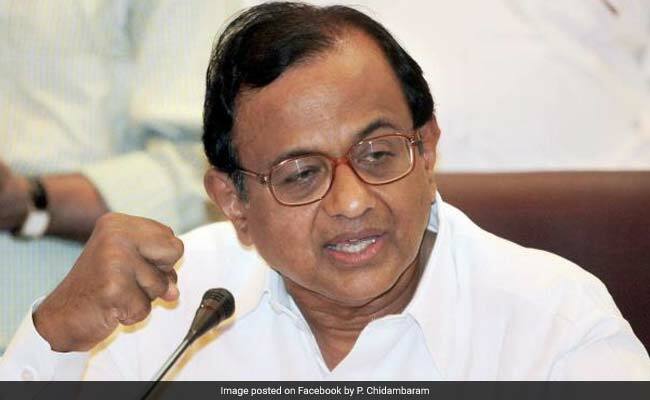 Senior Congress leader P Chidambaram tweeted on Sunday night that he expected raids soon at his homes in Tamil Nadu, alleging that the ruling BJP's intention is to "cripple the campaign" for the national election that starts on Thursday. Mr Chidambaram, who is accused of wrongdoings in clearing foreign investments when he was finance minister in 2007 and whose son Karti Chidambaram is also being investigated for allegedly asking for bribe to use his father's influence to regularise investments, posted a series of tweets on a day a team of tax officers from Delhi searched the homes of Chief Minister Kamal Nath's aides in Indore and Bhopal over allegations of illegal cash transactions in election season. The home of former advisor to the Congress chief minister, Rajendra Kumar Miglani in south Delhi's posh Green Park, was also searched in a pre-dawn raid. The tax department alleged the men have made a large amount of illegal cash transactions in election season. Late on Sunday night, Mr Chidambaram claimed "he had been told" about the tax department's "plans" to raid his homes in his Sivaganga constituency and in Chennai. "I have been told that the IT department has plans to raid my residence in Sivaganga constituency and in Chennai. We will welcome the search party," tweeted P Chidambaram. "The IT department knows that we have nothing to hide. They and other agencies have searched our residences before and found nothing. The intention is to cripple the election campaign," the former finance minister tweeted. The people are watching the excesses of this government and will deliver a fitting lesson in the elections. The opposition has accused Prime Minister Narendra Modi's government of using the income tax department to harass and weaken them before the elections. The government has maintained the opposition has been misinterpreting the timing of the tax department's actions and politicising the raids. "The income tax raids cannot be called political. If they (opposition) have information, will they wait and check who is it related to, or which party? It should not be politicised. The Congress has a habit of making it political," BJP spokesperson Shahnawaz Hussain said on Sunday. The Election Commission on Sunday instructed investigation and enforcement agencies under the Finance Ministry to ensure that their pre-poll raids remain politically neutral, and mandated that its officials be informed in advance before any such exercise is undertaken. "The Election Commission strongly advises that all enforcement actions during the election period, even when conducted ruthlessly with a view to curb the blatant electoral malpractice (of using money power to influence voter behaviour), be absolutely neutral, impartial and non-discriminatory. Further, in case of suspected use of such illicit money for electoral purposes, the Chief Electoral Officer should be kept suitably informed while the Model Code of Conduct is in force," a letter issued by the poll panel to the investigation agencies read. Karti Chidambaram is fighting the national elections on a Congress ticket from Sivaganga constituency. His father alleged the threat of income tax raid is to discourage his son from putting up a fight in the elections. A Delhi court has from time to time extended the protection from arrest granted to him and his father. Karnataka Chief Minister HD Kumaraswamy, who heads a Congress-JDS coalition in the southern state, had last month put out similar tweets "warning" of raids on people linked to the two parties - the raids did happen, though the tax department accused the parties of politicising it. PM @narendramodi's real surgical strike is out in the open through IT dept raids. The constitutional post offer for IT officer Balakrishna helped the PM in his revenge game. Highly deplorable to use govt machinery, corrupt officials to harrass opponents during election time. Tamil Nadu will vote on April 18. Results will be out on May 23.